Óscar Gare	is ready to help you get the answers you need. Óscar Gare	will reply to your questions about Get extension name	shortly. We appreciate your feedback about your support experience with Óscar Gare, developers of Buy One Get One Free. This helps us maintain high standards on the WooMarketplace, and helps Óscar Gare improve. Glad to hear it went well with Óscar Gare. Tell us more. Did Óscar Gare get back to you? Do you have any additional feeback for us or Óscar Gare? 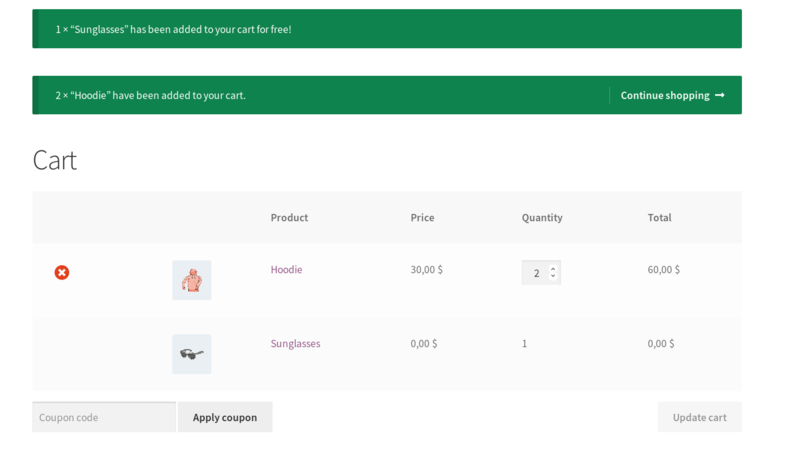 The Buy One Get One Free plugin allows to create offers of the type: if the customer adds to cart a specific quantity of a product, then add to cart one or more items of the same (or another) product. Giving away a free item(s) for the purchase of one or more products will encourage customers to spend more to get the item for free. Create a promotion for a single product from the admin product interface. You can configure promotions for all items in a product category. Give a Product A when shoppers purchase 5 or more Product A. Give a Product A when shoppers purchase one Product B. Offer a Laptop Bag if they purchase 1 or more items from the Laptops category.